engagement of Assistant Supervisor posts on Fixed Terms Employment basis. www.airindia.in. Total available vacancies in AIESL Recruitment are 85 posts. be paid monthly salary of Rs. 15180/- with annual increment of Rs. 400/-. Selection procedure are stated below. 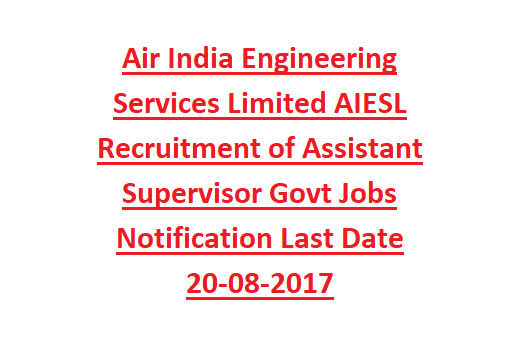 available in AIESL Recruitment are 85 posts. General candidate age should not exceed 33 years. For BC candidate maximum age limit is 36 years. For SC/ ST candidates age should not exceed 38 years. qualified BCA/ BSc IT/ Graduate in IT. soon on the website www.airindia.in. which will be conducted by the Company Medical Doctor. application from the official website of Air India @ www.airindia.in. of Demand draft payable at Delhi.